Henry Ford’s Model T was the world’s first mass-produced car and brought in a revolution in the automobile industry when it was first introduced back in 1908. 65 years down the line, Motorola made the world’s first handheld mobile phone that brought in a revolution in the telecom industry. The Ford Model T, like other cars, used gasoline for working while Motorola’s handheld mobile phone used lithium-ion batteries for its functioning. Fair enough, there weren’t many similarities between cars and mobile phones until 2012. That’s when Elon Musk drove in the Tesla Model S, a full-size all-electric luxury liftback that used the same source of power that mobile phones used. Lithium-ion batteries. And it uses more than 7000 of them. This altogether kicked in a revolution in the auto industry, a new trend was set and the Tesla Model S gave us a peek to the future which already seems to be electric! Now with all that being said, done and dusted, the very first question that creeps to a consumer’s mind while planning to buy an electric car of this size is that how much power does it make? Basically, how fast is this car? Well, Tesla has stopped rating its motors in traditional horsepower or kW but this car is seriously fast. The Model S rockets to 60 mph from rest in 2.5 seconds which matches the 0-60 mph timing of the 2017 Bugatti Chiron which means that this luxury car that has 5 doors and can carry 5 people is as fast as the world’s most popular supercar. Cool isn’t it? Yeah that’s cool, but what’s the top speed of this car? Clearly, the Model S isn’t built for the race track and its purpose largely remains to daily drivability and utility. The standard all-wheel-drive system of this car has helped it to achieve a decent top speed of 155 mph which is, in fact, better than some of its combustion engine powered rivals. That’s great but how long can this car run on a single charge? Can I go on long road trips in a Tesla? The Tesla Model S is a long hauler. The top of the line P100D trim level of the Model S comes fitted with a 100 kWh battery which can power the car to cover distances over 330 miles on a single charge. Moreover, on charging for 30 minutes, the batteries propel the car to cover distances more than 170 miles. Also, Tesla has set up over 10000 charging stations across the country and so the Model S can be your trusted companion for long road trips. Well that sounds great. But what about technology? What about safety? The 2018 Tesla Model S one of the safest cars that your money can buy. The car comes equipped with unbelievably futuristic driving aids and safety features. The ‘Enhanced Autopilot’ system comes with a full self-driving hardware and self-driving capabilities which means that this car can judge the traffic and guide itself through the roads. The car also comes with industry-first features like autosteer, automatic parking, summon, emergency braking and automatic lane change which makes it one of the safest cars for not just the people traveling inside it but also for the people driving around it. That’s awesome! But hey you said that this is a luxury car. Didn’t you? So how’s the feel on the inside? Hop on to the inside and you’ll find the interiors to be calm and serene. Up front, the absence of knobs and buttons will surprise you and what you’ll find is a large 17 inches touchscreen display. The amount of space offered on the front and the rear is also great and is as good as anything you’ll get in a mainstream luxury sedan. Moreover, the standard full glass roof also offers a great in ride ambiance during the day as well as in the night. One final question. The price? The 2018 Model S comes in three trim levels with the base 75D (which comes with a 75 kWh battery pack) being priced at $79200. The mid-spec 100D trim is priced at $97200 while the top of the line, performance spec is P100D is priced at $136200. Now, the prices are a little bit on the higher side when compared to its combustion engine rivals but this car is a great investment and its running and maintenance costs are much less than the combustion engine cars which means the car will come easy on your pocket in the long run. 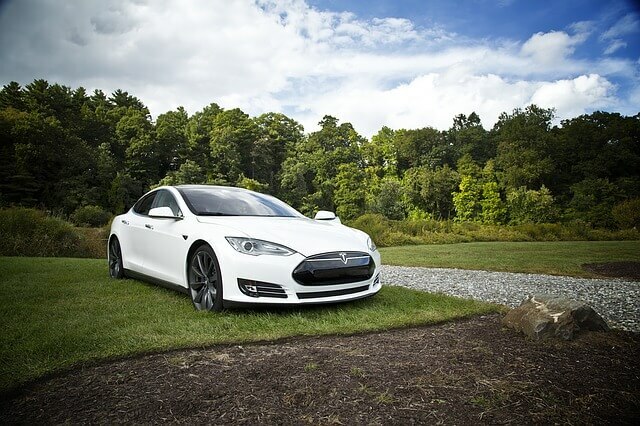 With the Model S, Tesla set a trend that others followed. Many companies have now come into the EV business but none of them has been able to capture the market as Tesla did. The Rolls-Royce of the EV business as we would like to call it, when are you getting your Model S into your garage?